Ever since my nominal success at the Schlafly pork steak competition with making steelhead trout BLT paninis on a BBQ smoker, a few family members have asked to try them. I’ve obliged a couple of times, since I love fish sandwiches. During the biennial in-laws’ trip to the beach, each individual sibling family takes a night to cook dinner for the whole extended crew. That’s 17 adults and 17 kiddos. We drew this past Sunday, and everyone wanted the fish sandwiches. Normally not an issue, but I’ve never done this on a gas grill. In fact, I’ve never smoked anything on a gas grill. The only woman I’m pimping from now on is Sweet Lady Propane. And I’m tricking her out all over this town. Not only is this a propane gas grill, but its a really crappily maintained one. Huge hot spots and some cold zones, along with a non-working igniter. Sweet. In this peril, I reached out to someone who knows what the hell he is doing for a little free advice. I shot an email over to Scott, the proprietor of the Grillin Fools website. Scott is a far more experienced BBQer than me, and he happened to marry one of my college friends. His website is a learning tool for those thirsty for knowledge. My website, by contrast, is a chronicle of my journey from wild incompetence to (hopefully) proficiency. 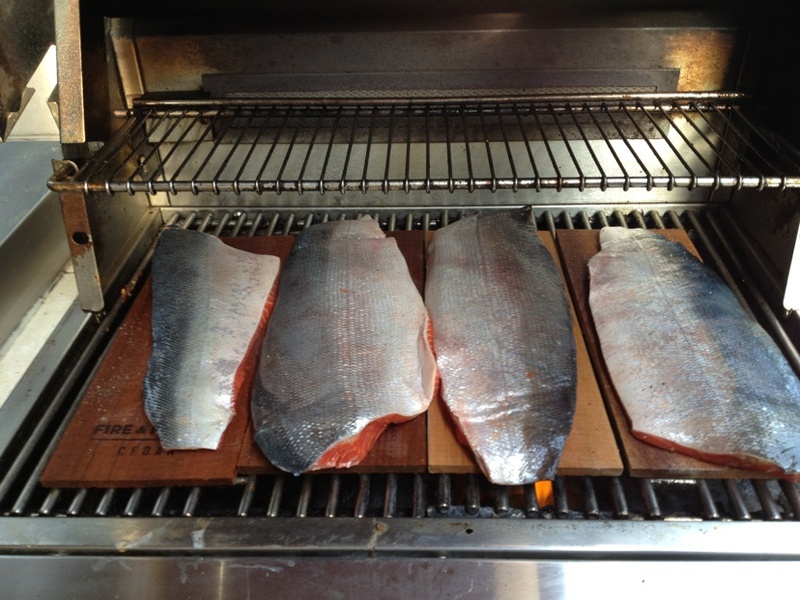 For the protein, we found some huge salmon filets and a bunch of tilapia. In addition, why not thrown some Portobellos on the grill as well. I cleaned out the local Publix of all of their cedar planks. The original Grillin’ Fool told me that cedar planks on the BBQ would work just fine, but it might not hurt to practice on a gas grill before the big event. He also suggested maple planks as a milder alternative to the cedar wood. Since I am adding maple bacon, I will stick with cedar for now, but a maple plank will definitely be in my future plans. He’s a fan of arugula and tomatoes on fish sandwiches, too. Many thanks to Scott, and you should check out his site when you get the opportunity. 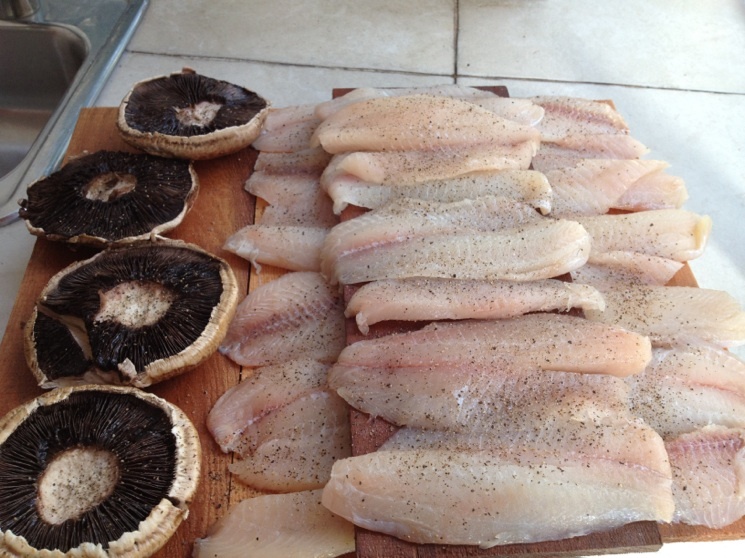 The only seasoning I put on the tilapia and Portobellos was coarse freshly cracked pepper and some sea salt. The house we rented had no olive oil or canola spray or anything, so I would rely on the soaked cedar smoke to keep this from all drying out. 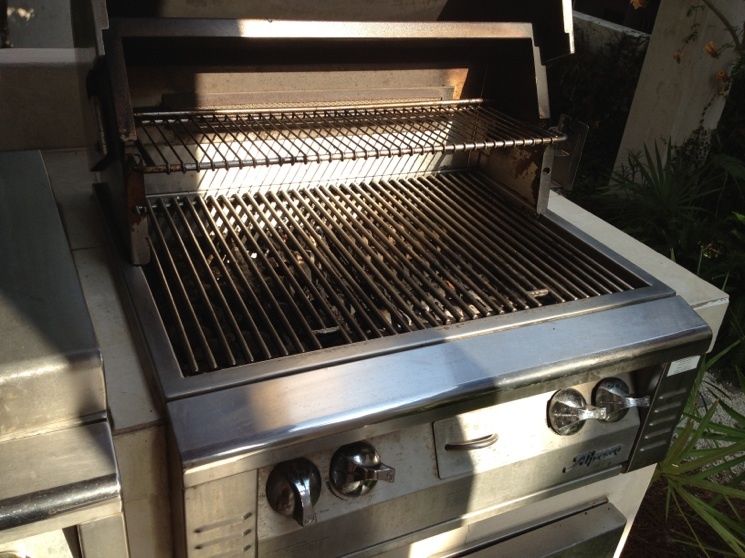 Once on the grill, both knobs were turned down to low, and fingers were crossed. 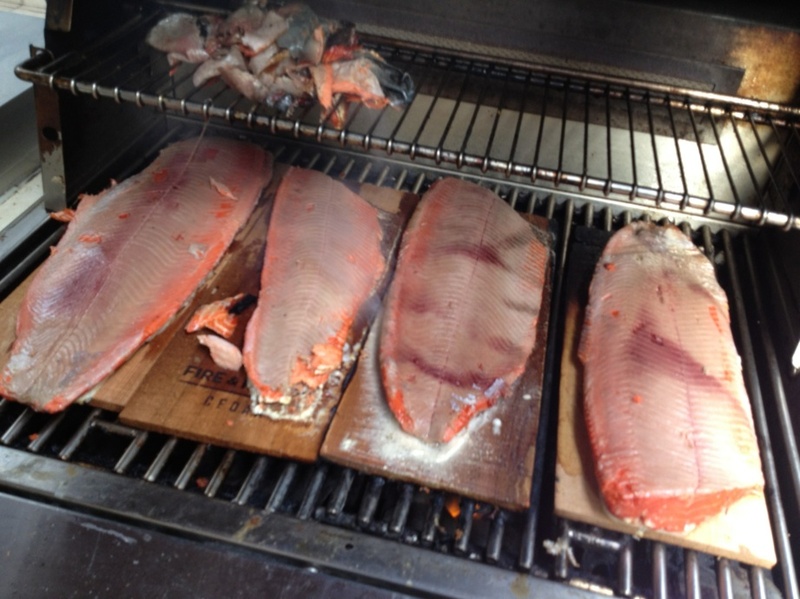 I noticed as the fish cooked that the cedar charred far more than on my ugly drum smoker, obviously due to the variance in proximity of the open flames to the wood. I do want some charring and the smoke associated with it, but I don’t want all of my food to burst into flames. Now would be a good time for a beer. 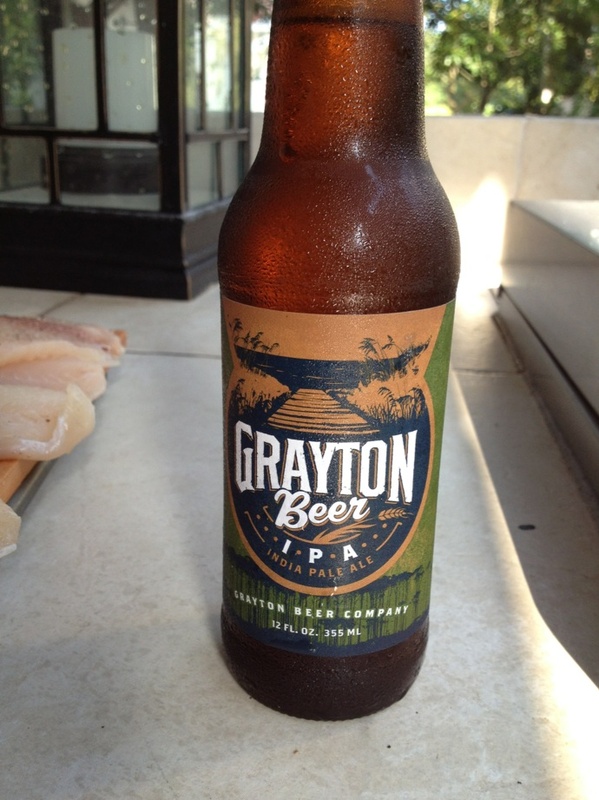 At the local liquor store, Kwiker Liquor, a sign prominently pointed out Grayton Beer Company as a local brew. Of course I bought a sixer each of the IPA and the Pale Ale. Both are solid beers, and I’m happy to sample and support a new craft brewery. Back to the fish, it appears that nothing horrible has happened while I pounded beers. No one ordered cedar plank sashimi. More smoke needed. It also appears that the fish wasn’t really cooking that quickly, so I tinkered with the propane knobs. Eventually a good billow of smoke was coming from the grill vent. Once the tilapia and mushrooms were cooked to my satisfaction, I put the planks on a cookie sheet, wrapped it in foil, and put it in the indoor oven to warm. The large amount of food and severely limited grill surface area meant I would be cooking in shifts. Up next, the salmon filets. 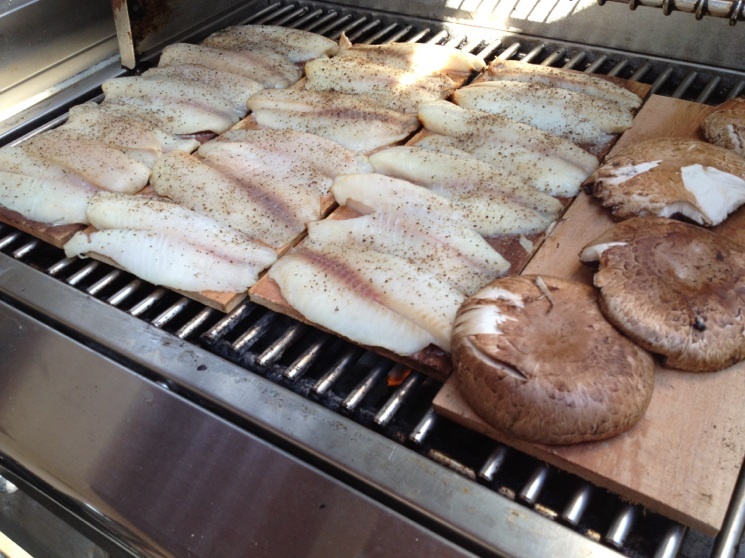 In my (limited) experience, when you cook a huge filet of fish on a plank with the skin on, cook it with the skin up. After a little while it will peel or crisp right off. I coated the non-skin side with more cracked black pepper and sea salt, then put it all on the grill for a second stage of smoking. Twenty minutes later, the skin came right off. Skin bacon on the top shelf and no dog to share. 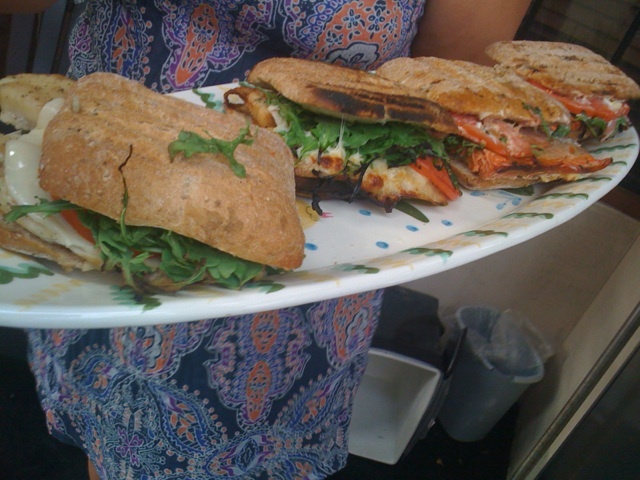 Once all of the fish had cooked, I assembled a series of sandwiches with some ciabatta bread. As usual, we had some huge sliced tomatoes, a few pounds of cooked maple bacon, mayo, arugula, pepper jack and Muenster cheeses. Some of the smarter family members came downstairs and made special orders. I found a walking path of 16″x16″ exceptionally heavy paver stones and wrapped one in aluminum foil. 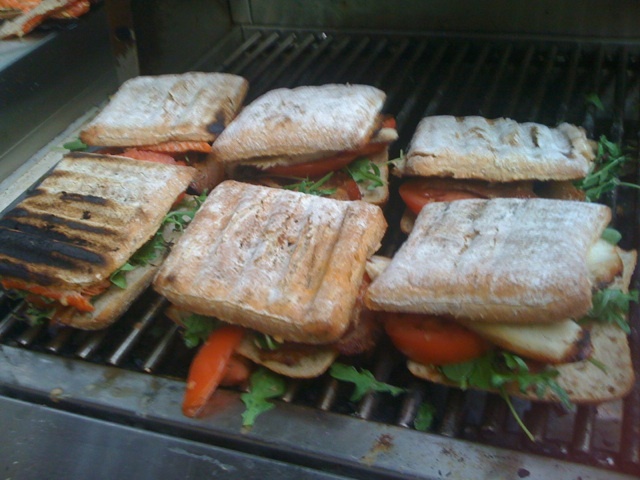 Panini press … presto. While all this stuff is pressing, now would be a good time for some… fireworks. 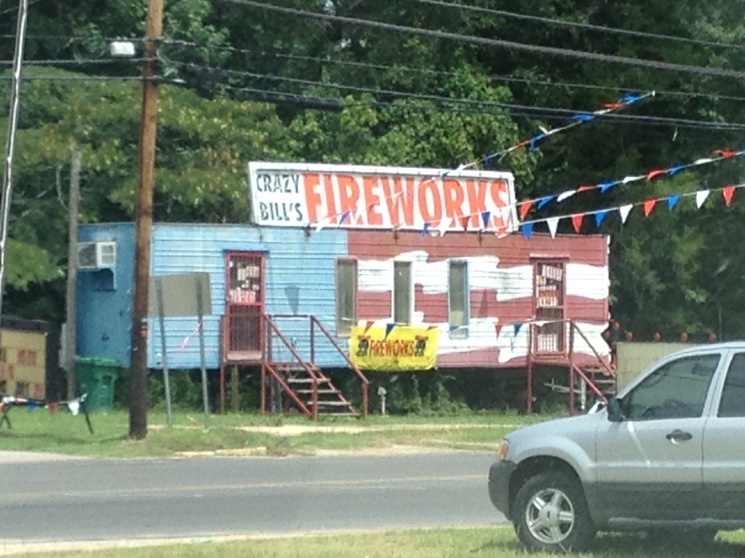 Not sure if they’re legal here in Florida, but there was a plethora of questionable fireworks retail establishments set up in trailers of varying levels of deplorability throughout Alabama. None was as epic as Crazy Bill’s. I took that picture from a Burger King drive-thru. Burger King is usually off my menu, but it was the first place we could eat in over an hour and my kids were getting cranky and famished. I begged (BEGGED!) my wife to let me swing by Crazy Bill’s, but she declined. In the interest of marital bliss, I resigned to just taking the photo. Dammit. Back to the task at hand, the delicious fish. I could only panini six sandwiches at a time and we only planned to make 20-24, with the littler kiddos having chicken nuggets. For a side, we all shared some Paula Deen macaroni and cheese (pro tip: not healthy). The paver stone did it’s magic, and by magic I mean it provided a bunch of evenly distributed weight that created an improvised panini press on the grill. Note the uneven burning / non-burning on some sandwich portions. You can thank the aforementioned crapola BBQ grill. This doesn’t happen on Big Blue. 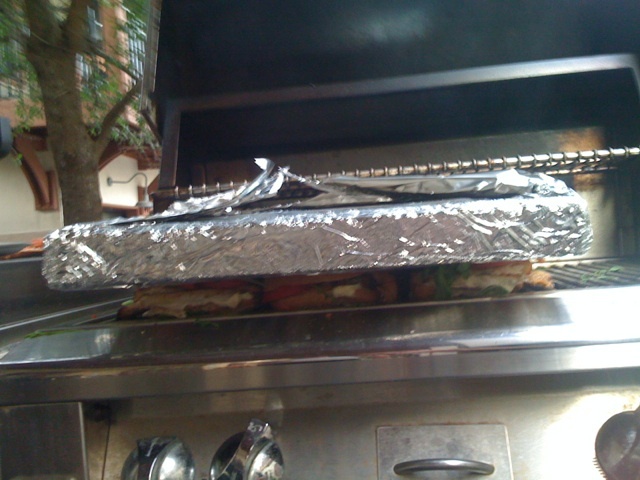 We served them up family style, cutting each massive sandwich in half. 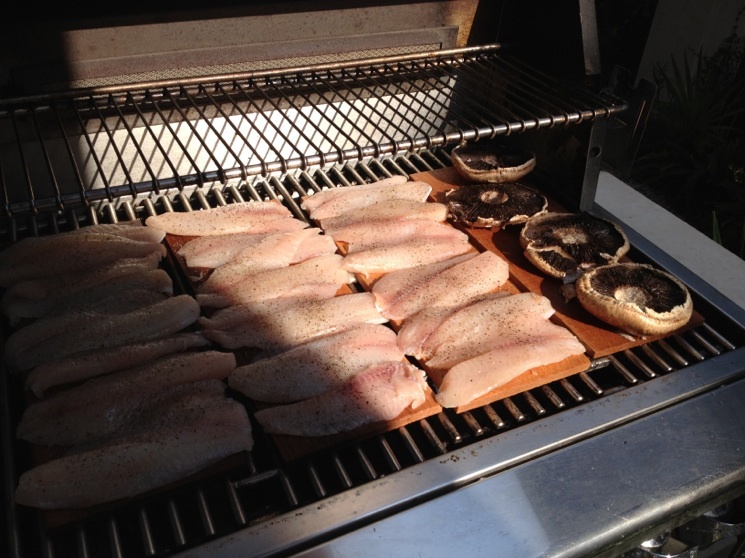 Oddly enough, the Portobello sandwiches went very fast, and tilapia was a huge hit. The only leftovers were salmon sandwiches. 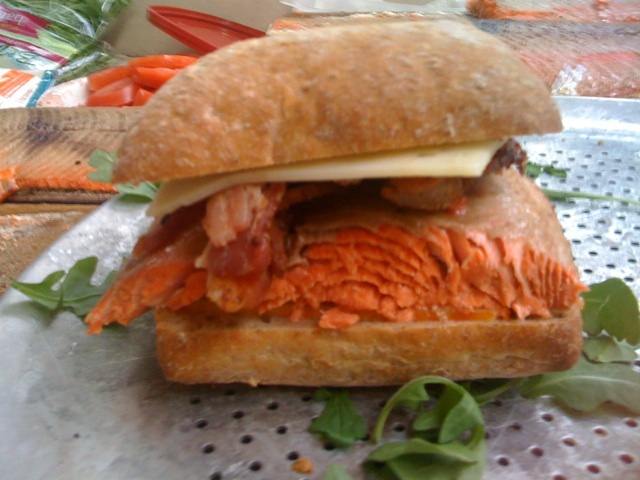 Even though the panini process combined with my Pile High sandwich assembly method left the sandwiches looking like a huge mess, the food was wildly well-received and I was flattered with the thanks. After spending seven or eight beer-filled hours on the beach, cooking this dinner was utterly exhausting. Who knew the Florida panhandle was as unbelievably hot and humid as St. Louis? Despite the abomination of cooking on gas, things worked out well. I’m happy that I was able to be able to produce solid results on a foreign grill with an infrequently used fuel source for so many people. It was unnerving at times, but the end result of the family’s collective bellies being full of good food and beers was worth the stress and effort.